Meet NinjaBro, the only ninja at Mt. Caramel High School. 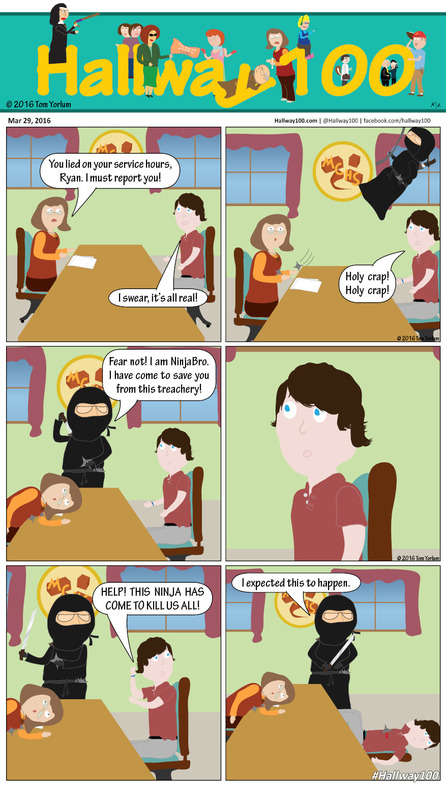 Probably the only ninja at any high school in Wisconsin. The week of NinjaBro continues with Bro revealing his identity to Roma tomorrow. Pop Quiz: Did Bro have any selfish reasons for wanting to take out Polly? This isn’t the first time he’s tried to assassinate her. Extra Credit: This is our third time meeting Ryan, the Student Council President. Looks like he avoided a very shaky scandal regarding his lack of service hours. If you call taking a throwing star to the gut avoiding.